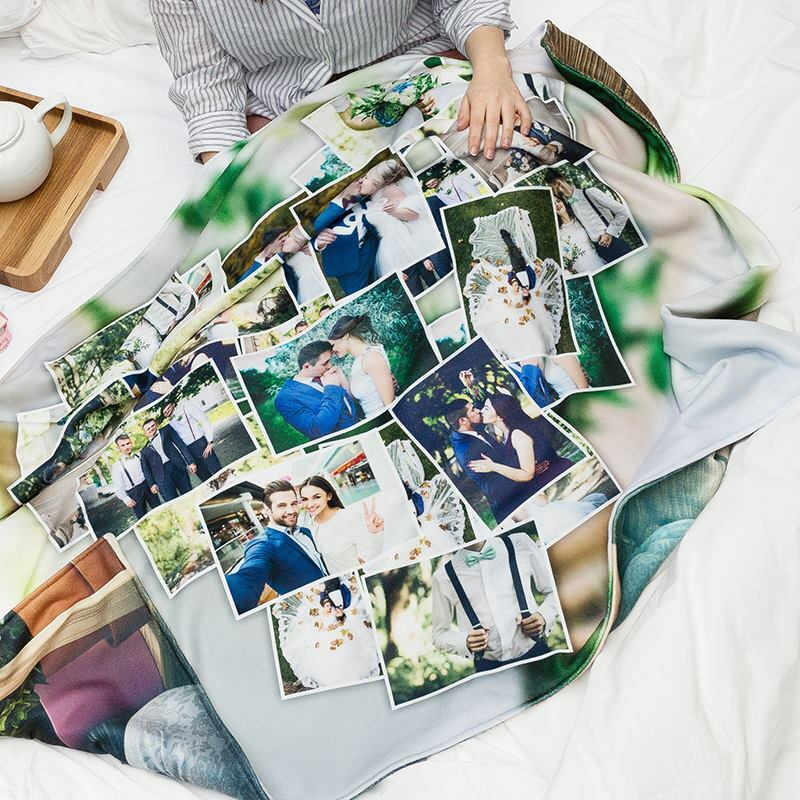 Design a personalised wedding blanket for your big day or as a gift for the newly married couple and show off your special photos for everyone to see. It's made from beautifully soft polar fleece fabric, ideal for draping over the couple's shoulders as they stroll around the courtyard on the evening. Choose from four sizes and print your unique designs on one or both sides. Design a unique wedding blanket for your big day and use it as a shawl for the both of you to snuggle under on the evening, a decorative feature for the top table or even as blankets for the guests. Outdoor weddings are extremely trendy, and it's nice to have some original ways for the married couple and guests to keep warm. Left on outdoor seating for guests to wrap around themselves, it's a totally bespoke accessory that is sure to be a point of conversation. Made from anti-pilling, water repellent polar fleece, they are hardwearing and durable with a vibrant print on one or both sides. We left it a bit late to order for a birthday, but you got us three 2-sided custom fleece blankets within 3 days or our order - brilliant. The blankets were so soft and beautiful quality- the photos looked great, The online design template was really easy to use. The quality of the blanket, and clarity of the photos far exceeded my high expectations. A personal and memorable gift for my son' s 13th birthday. Even he said is was cool !! This offer is ideal if you're creating several blankets for the wedding party to enjoy. Design three blankets for the price of two. Each blanket can feature the same or different design, just make sure there are three blankets in your basket and the discount will automatically be applied. Handmade by our expert seamstresses with love and care, your bespoke blanket for weddings radiates elegance and luxury. Two layers of thick fleece are printed and hand stitched together, resulting in a 570 gsm blanket. With single-sided printing, your photos appear on the front in high definition, and the back is printed with the colour of your choice; either soft pink, baby blue, black or ivory cream. With a discreet hem and optional label, we guarantee the finish to be flawless. Care: Your wedding blankets are easy to care for, making them a long-lasting gift to be enjoyed for years to come. Simply machine-wash at 30°c and leave to dry naturally. You can also tumble dry on low heat.Please note: As everything we provide is handmade to order, all sizes may have a slight variance. When you print on one side only, you get a choice of 4 colour for the backing, so choose one that complements the colours of your photos, or go for a contrasting colour to make a stark impact. We print edge-to-edge with only a fine hem, so only a tiny fraction of your design is used to stitch the hem. The photo reproduction is incredible, so there are no boundaries when it comes to what you can print. From solid block colours to intricate details, let your creativity flow and design a beautiful, bespoke wedding blanket. Create a selection of wedding fleeces for the guests to use, printed with the name of the couple, the date of the ceremony and wedding hashtag you've created to collate all the photos on social media. Choose a background colour to match the theme and let friends and family wrap up without spoiling their gorgeous outfit. If your wedding venue is a barn, field or even a cave, this amazingly thick, warm wedding blanket is the ideal accessory for the bride and groom to share when they walk back up the aisle after saying their vows. Printed with 'Just Married' and a picture of the happy couple, it's an alternative to the obvious traditions. Sumptuous with a luxury handle, this custom printed wedding blanket makes for a fine gift. With special memories from the big day, it's a stunning sentimental keepsake that can be taken on their honeymoon or kept on the marital bed as a decorative but nostalgic feature.